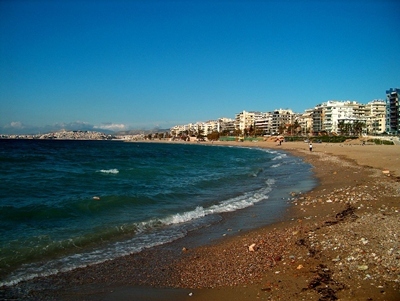 Many of the Athens Beaches are situated in the south-east coast around Glyfada's district. Sadly, most of them are private, which means there is an entrance fee to enjoy a swim. It is a quite crowded(especially during the weekends)sandy beach free of charge. There is a beautiful marina close by where it is nice to take a walk and admire the sea or just sit in one of the benches and relax with the beautiful natural scenery combine with the presence of the sailing boats at the marina. Also there are quite a few good cafes and bars to enjoy a drink or refreshment. 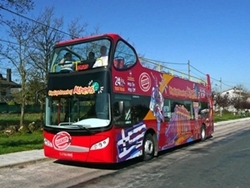 Close by you will find the Flisvos Park the Athens - Piraeus new metropolitan area which was build for Athens Olympic Games 2004. Alimos has a very nice beach which is swamped with people especially during the weekends and there are quite a few good cafes and bars to enjoy a drink or refreshment. A quite long and broad nice sandy beach, with plenty of recliners and beach umbrellas, showers and beach cabanas. There is also a beach shop where you can find sunscreens, togs and beautiful pareos, clever T-shirts and ethnic handbags. It is mostly beach for teenagers, however families with young children come too as the waters are quite shallow. You can enjoy playing with rackets, water slides and the beach bar where you can find anything from sandwiches, crisps, cheese pies, ice cream, coffee and more. It is located on the south-east coast. It is one of the most popular places where most of the Greek population goes during the summertime to enjoy the incredible quantity of trendy clubs and bars boarding the town and the coast. Around Glyfada you may discover a lot of private beaches as well as some lovely rocky creeks obviously less crowded than the big sandy beaches. 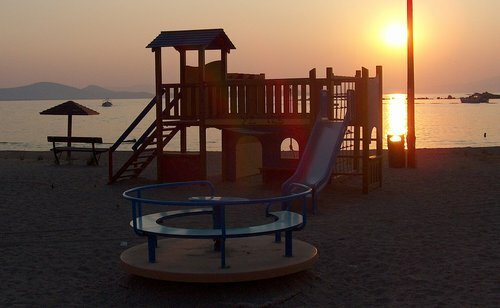 Glyfada Beach is known for the tourist facilities of various kinds, both sports and recreational. Along the beach there are a lot of fish restaurants, bars and discos. It is founded a little bit further than Glyfada Beach, with some free of charge sandy beaches and another one where you pay a small fee for one beach umbrella and a couple of lay back chairs. 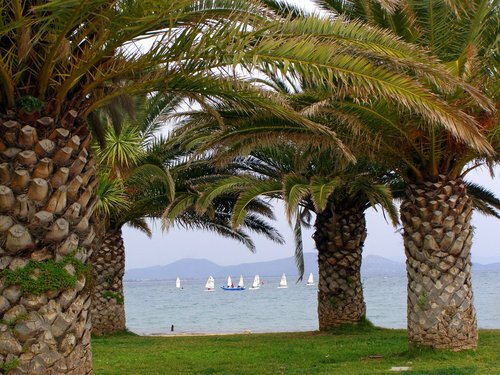 Vouliagmeni Beach has been awarded with the blue flag for its clean waters and offers facilities such sandy beaches with beach umbrellas, sunbeds, showers and changing rooms, snack bar erj. Wind surfing, Water skiing, Jet skiing, Canoeing, Fishing, Diving, Boating and sailing as well as Waterslide are some of the sports it offers. 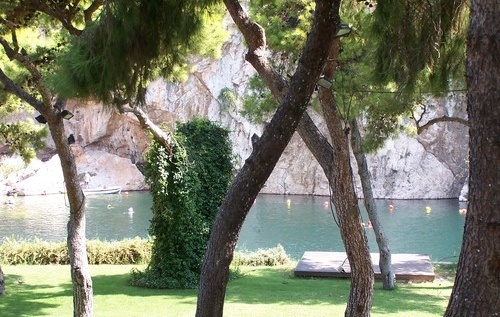 Vouliagmeni is famous for its natural lake "The Lake of Vouliagmeni". Its crystal clear waters come from underground natural caves, which pour their waters in this lake. All year round, its waters have a steady temperature of 25C.The waters of Vouliagmeni Lake are known to be therapeutic for rheumatism, arthritis, neuralgia and gynecological problems and others. Varkiza is a small coastal town 22Km south of Athens . It is well known for its fine sand beach which gets quite busy in the summer months. The new facilities of Varkiza Beach include water slides, beach bars, a traditional ouzeri, a seafood restaurant, a brasserie, snack bars, an ice-cream corner, a beach wear shop, a cinema and special areas for receptions. The sand is spotlessly clean. 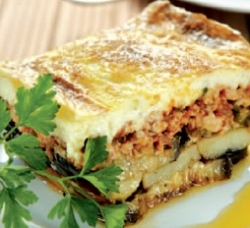 Situated at 65km from Athens it lies at the most southern part of mainland Greece and it serves as a gateway to the Aegean Island. This splendid rocky promontory carry on its highest point the Temple of Poseidon. Some beaches are owned by hotels and they charge you to let you swim but there are also a lot of free public beaches as well which are always almost empty. 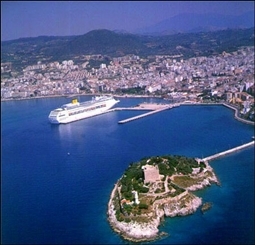 Rafina is located on the east side of Athens and it is the second most important port for passenger ferries after the port of Piraeus. You can find a lot of small beaches and some camping around the area. 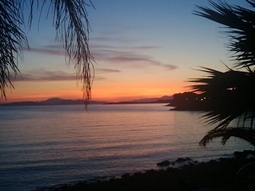 There is a choice of many beaches to explore along the beautiful coastal area of Porto Rafti. The best one is the Avlaki Beach. On the sea front there are many fish tavernas, clubs, open air cinemas, restaurants, children's playgrounds and a swimming pool.It also offers a basketball court and a bar. Also the Erotospilia beach is another nice beach in this area. This is an organized beach with beach umbrellas and chairs, changing rooms and showers, a tennis and a basketball field. It provides restaurants and there are also fish taverns. There are also a lot ofother Athens beaches with some of the best known such as the Porto Germenos, Oropos, Kalamos, Votsalakia, Vavrona, Loutsa, Kalivia, Thimari, Anavissos, Lavrion, Lagonisi etc. In 2009 over 3450 beaches and marinas were awarded the Blue Flag. The Blue Flag Programme is run by the independent non-profit organization Foundation for Environment Education and is dedicated to labeling beaches and marinas appropriate for swimming. The criteria that a beach must fulfill to get a Blue Flag has to do with its cleanness, the water quality, organization, safety of the swimmers, environmental protection and other services. 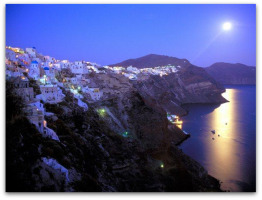 Greece with its 421 beaches and 9 marines, is ranked in the second position among all other countries from Europe, Africa, New Zealand, Canada and the Caribbean. 41 countries are currently participating in the Blue Flag Programme: Bahamas, Belgium-Flanders, Belgium-Wallonia, Brazil, Bulgaria, Canada, Croatia, Cyprus, Denmark, Dominican Republic, England, Finland, France, Germany, Greece, Iceland, Ireland, Italy, Jamaica, Latvia, Lithuania, Malta, Montenegro, Morocco, Netherlands, New Zealand, Northern Ireland, Norway, Poland, Portugal, Puerto Rico, Russia, Romania, Scotland, Slovenia, South Africa, Spain, Sweden, Tunisia, Turkey and Wales. The information about awarded sites is updated each year on 5 June for Europe, Canada, Morocco, Tunisia and new countries nearby, and on 1 November for the Caribbean, New Zealand, Brazil, South Africa and other new countries in the vicinity. To date, there are 2808 awarded beaches and 650 awarded marinas in total worldwide.